Fringe fabulous over the top amounts of shaggy fringe on the trim of this coat. Puffs of creamy colored cloud faux fur top this hooded pompom coat. 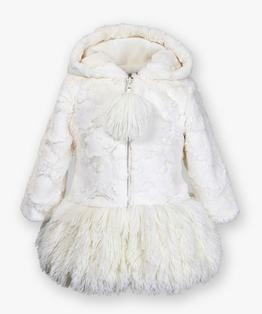 The bottom is trimmed with an ice frosting faux fur shaggy bottom. A true fashionista's find! Machine Washable. 100% Polyester. Imported Sizes available 12months - 12 years.